Advertising Creative case studies: we currently have 23. To celebrate All Hallows’ Eve, Adobe hosted a little murder mystery challenge for Photoshop users on its Photoshop Facebook page. This case study looks at how the campaign resulted in over 4.8 million impressions and 22k Photoshop downloads of the game. Adobe Photoshop: Murder Mystery Case Study (full edit) from Edelman West on Vimeo. YSL chose PageSkin Plus, with animated sidebars and the campaign video integrated into the large creative header, to promote the launch of their new Gloss Volupté lip gloss. This case study looks at how the luxury beauty brand achieved huge ad recall and brand uplift far above industry benchmarks. How do you measure success in a digital campaign? Getting more YouTube fans, Facebook likes or newsletter sign ups is all well and good, but do these actually translate to more sales and justify the initial spend? We look back at some of the best food campaigns of the past year that show how digital success translates into real world cash. To reinforce its World Cup sponsorship, Adidas worked with InSkin Media to run this World Cup display campaign optimised to get the most from desktop and tablet publishing sites. adidas wmv from Danny Meadows-Klue on Vimeo. How do you go about promoting a horror movie about a devil child? There are all the usual routes--TV ads, billboards, websites, trailers--but perhaps the best way to convey the spirit of the film is to actually scare the living hell out of people with an actual devil baby. Following on from the success of Carrie’s YouTube prank last year, the makers of 20th Century Fox’s latest horror movie ‘Devil’s Due’ have used a similar tactic to great effect- getting over 36m views in the process. Airbus used BBC campaign to create awareness of the Airbus A380. The campaign had a one-day global takeover of key sections on bbc.com was to maximise the impact of Airbus’ advertising budget and maximising the opportunity represented by the Dubai Airshow. The online advertising campaign on bbc.com delivered 25 million page impressions in just 24 hour, helping to create brand awareness and favourability. Online advertising is soaring worldwide, but some formats work better than others to get the message across to consumers. This US-based infographic from InsightsOne looks at those ads that cause the most irritation- and the negative impact on the brands behind them. Salvatore Ferragamo used BBC online advertising to attract and engage at the launch of the new shoes range. The luxury brand for men reached out to its consumer with banner ads on BBC.com, at the weather and travel sections. They also used behavioural targeting aimed at socially-conscious audience interested in Science, Environment & Energy and Fashion & Luxury. The campaign resulted in 103% uplift in brand favourability from those who saw the ads on bbc.com compared with those who hadn’t seen any advertising. 86% of respondents who had seen the ads on bbc.com were familiar with the Ferragamo brand, an uplift of 62% from those who had not seen any advertising. Adidas ran this mobile campaign to promote its latest football boots. Mullen’s mediahub worked with Millennial Media to target users across multiple mobile platforms, inviting them to the Adidas’ “Light You Up” promotional light show. To cap off the event, footballer Lionel Messi joined everyone at New York City’s Penn Station. This is a great example of how location based targeting can be used with mobile video to reach local users with relative and time sensitive messages in order to drive foot traffic to an event. Banner ads engaged nearby users to click through to the landing page to see event information. This summer saw Channel 4 run its ‘Superhuman’ campaign to promote the London Paralympic games. Working with Mediasyndicator, the online element of the promotion attracted more than 150,000 interactions. As part of Channel 4’s ‘Meet the Superhumans’ online Paralympics advertising campaign, deployed in partnership with digital advertising specialists, Mediasyndicator, also captured the attention of online audiences – with results revealing the campaign achieved over 150,000 interactions. Ahead of an annual Beauty Queen pageant held on International Women's Day, Dove created a social media campaign entitled "Beauty Does Not Have Just One Queen." This case study looks at how, with one outdoor billboard and a highly targeted Facebook app, the brand created a huge amount of online engagement and 23,000 new Facebook fans. The campaign, for the Unilever-owned cosmetic and toiletry brand, used a Facebook application that was connected to a digital billboard in the heart of Tel Aviv. Women uploaded a picture of themselves using the app, and their portrait was then screened on the billboard with the caption "Beauty Does Not Have Just One Queen". Cable channel Reelz used a technique called ‘Smart Versioning’ to continually adjust text, video and URLs in ads based on response, in order to boost ROI. As a result, the campaign achieved a 200% higher dwell rate than average. The purpose of the campaign was to get audience attention and increase the website traffic. Smart Versioning enabled for ongoing changes, text, video, and URL feeds. And all updates that would otherwise take hours with smart version can be done in only a few minutes. The regular ongoing updates resulted in high dwell rate. The campaign resulted in dwell rate of 10.35%, 200% more than the entertainment vertical. The goals for Pepsi were to bring awareness to their updated brand and logo, re-establish Pepsi’s position as a youthful challenger brand and tap into the iconic “change” social/political movement of the Obama election. They also wanted to foster brand community through 2-way communication with customers and chose the web and a social marketing model as the way to achieve this. 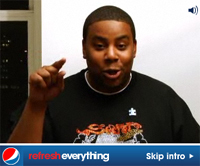 Their ‘Refresh Everything’ message was a natural fit with Obama’s drive for change in politics and social values, and the campaign harnessed video content, social media and digital marketing in innovative ways to reach the millennial generation. The model centered around an open letter to Barack Obama and saw consumers recording their webcam messages directly from a video banner. This got them not only interacting with the banner, but actually creating content and pushing it back to the brand. Food manufacturing giant Nestle has come up with an innovative use for Twitter that combines together a mix of digital channels. 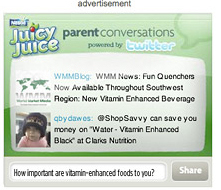 Their latest advertising campaign for JuicyJuice includes a Twitter feed within the advertising creative. This social media campaign lets people post their own tweets within the advertising that appears online. At the time of writing, the brand is testing it on US sites CafeMom and BabyCenter. Here’s how it works: there are questions inside the advertising space that relate to parenting (How do you stimulate your child's mind? How important are vitamin-enhanced foods to you?). People can write their message or tweet inside the advertising. A mint, a fizzy drink and a schoolboy prank taken to extremes. We must have watched this 50 times and still it gets a smile. These videos with quality production values and good direction tell a story that’s right in tone, length and format for the web today. Thanks to YouTube they’ll be around 10 years from now and still reinforcing the brand. But as a creative concept this wasn’t created by the brands; it grew from the street and wasn’t easy for the brands to accommodate at first. What many marketers forget is that for every firm there are brand adorers and brand vandals and there needs to be a strategy for dealing with both. Over the next 10 years the centre of gravity of the web will shift to social media and firms need to have these strategies in place before their brands and content start being used. Marketing in social media demands creating material people want to share. The principles of getting this right grew from the early days of viral marketing in the mid 90s and are closely related to PR. ‘Enjoy the film.